Next year I will be teaching my 4th Kindergarten student. It’s always fun when one of my children becomes an “official” member of our homeschool. Yet, it’s often a little stressful to cram more things into our schedule. Let me tell you my Kindergarten philosophy and how that philosophy has changed over the years. With my first K student, Curly, we WAY overdid the Kindergarten stuff. Not that either of us minded too much – we had lots of fun with themed art projects and science experiments and about a million picture books. I was super excited about Kindergarten and all the fun projects. We had a very busy year! When Tiger hit Kindergarten age, I was struggling through addition with Curly during our “dark years” when she could not do math at all. (I’m glad to say that she has seen the light and is now quite proficient at all things math). So, Tiger’s Kindergarten was a simpler version of my first Kindergarten experience. It had fewer themes and required less planning and fewer library trips. Bee’s Kindergarten was even more pared down than Tiger’s Kindergarten time. I tried to keep things simple as I worked through Curly’s math struggles and Tiger’s reading struggles. She also listened in to a lot of the science, history, and reading times with her siblings. This meant that there was less individual time and more joint learning time. Now it’s time for Kindergarten round 4. And as you can guess, it is fairly simplified. But as I keep telling myself – this is ok! Kindergarten at my house only takes about 45 minutes of one-on-one instruction time. During this time we work on letter sounds and the basics of learning to read. I use All About Reading for this, and the program has been amazingly effective for my kids. They enjoy the readers and love all the simple games included with the program. I love the constant review of the word cards and fluency pages. We also work on math concepts with Right Start Level A. I do about half a lesson per day and we do lots and lots of review with the manipulatives. My goal is to build a solid math foundation in the K year. We take math very slowly. For science I read picture books and readers with my little student. Some of our favorites are the Let’s Read and Find Out series and the Usborne beginning readers series. We enjoy exploring fun science topics. We also usually work on the Nancy Larson Science K to learn basic science concepts. We only use on this program 2 days per week. History is a combined subject so my little K students gets to listen to the picture books about our current history topic. I don’t worry much about history retention but rather exposure. For handwriting, I teach my Kindergarten child how to form letters using a lined personal white board. Every day we practice a few letters until my child is confident enough to try practicing on paper. I keep this time very short and simple to avoid frustration. I’ve learned that Kindergarten kiddos often lack the fine motor skills to do much writing. So I try to keep the writing time to a minimum and move at the pace dictated by my child’s abilities. I don’t worry about any spelling or writing in the K year. My child does virtually no writing outside of practicing a few letters per day on the whiteboard. I don’t like to rush my kids into writing; therefore, I limit the worksheets and try to keep our Kindergarten time very hands-on and simple. I add wonderful picture books and poetry books to our Kindergarten line-up. We read together every day. And I make sure that we read a Bible story from a good Bible story book each day too. Here is a great poetry book for kids and here is a Bible story book that we enjoy. I try to add in art projects and music appreciation when I can, but it often gets pushed aside in favor of extra play time or game time. We love these art books and this book is great for picture study. There you have it. Short and simple is my Kindergarten philosophy. And as you begin to homeschool Kindergarten you may find that you ask yourself, “Am I doing enough?” My answer is yes. It is enough. In the short amount of focused learning time that we spend on Kindergarten, my little students make great progress and it lays a solid foundation for the later years. Follow your child’s lead and move at his or her pace. No need to spend hours coming up with learning activities for Kindergarten. Focus on hands-on fun and play – and yes, this will always be enough at this age. 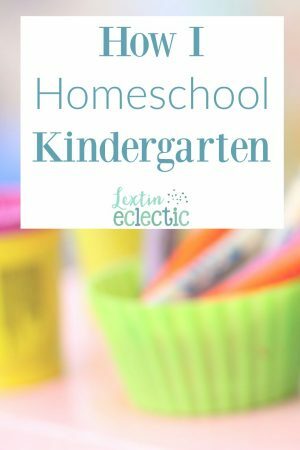 If you’re about to have a K student, you might want to browse through my Kindergarten curriculum choices and here are some great tips for preparing for your K year. And for a helpful guide to what your Kindergartner needs to know, I recommend this book. It will give you a great idea of topics to cover in the K year. I love the reminder to focus on play more, and not get caught up in just academics for kindergarten. I definitely changed my focus and the amount of work we did in kindergarten after my first child. I am so glad I learned to relax at little more! It is such a learning process! We make many changes to our plans each year. love it!! I usually over program, too. I have a new kindergartner coming up this fall, so I needed this one.